I mentioned earlier that Henry and Anne Dunn lost two of their sons in World War One. They were Henry and Robert Christie Dunn, their names are on the Invergordon war monument. Henry was killed in action on Monday December 21 1914 in Flanders. He was a member of The Household Cavalry, Cavalry of the line including Yoemanry and The Imperial Camel Corp. and the 7th Dragoon Guards. Robert Christie Dunn was killed in action on Saturday April 21 1917 in The Persian Gulf theatre of war. He was a Seaforth Highlander. Sadly there is not a photograph of either of those young men but surely they deserve mention here. Let those who came after see to it that his name be not forgotten. 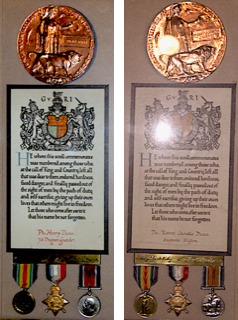 These Widows Penny's, scrolls and medals have a place of honour our home. They were presented to my great grandmother and were passed to my grandmother Mary Martin ( Dunn) at the death of her parents in Campbeltown Henry and Robert Christie were her brothers. Henry enlisted in the British Army in 1908 joining the 7th Dragoon Guards and was posted to India via Egypt. He returned to France upon mobilization of the Indian Army on October 12 1924. He went Missing In Action on December 21st 1912 the battle known as the Defence of Festubert. His remains still lies beneath farmers fields just north of a town called Givenchy. A good account of the battle is contained in a book called 'Honour and Fidelity' by Amarider Singh as well as other sources. My brother Peter Martin sent the photograph of the penny's and medals to Harry along with other earlier photographs of the Dunn family. Great to see that you have posted the pictures I sent you, will try to retake these and send clear ones. Sorry the dates came out wrong. Henry mobilized to France with the Indian Army in 1914 and died 1914. not 1924 and 1912. Thanks Innes, I can remember my grandparents Farquhar and Mary Ann Dunn going to Campbelltown to visit Farquhar's sister. I never met Mary Martin (Dunn), only the Invergordon side of the family. Thanks also to you John..